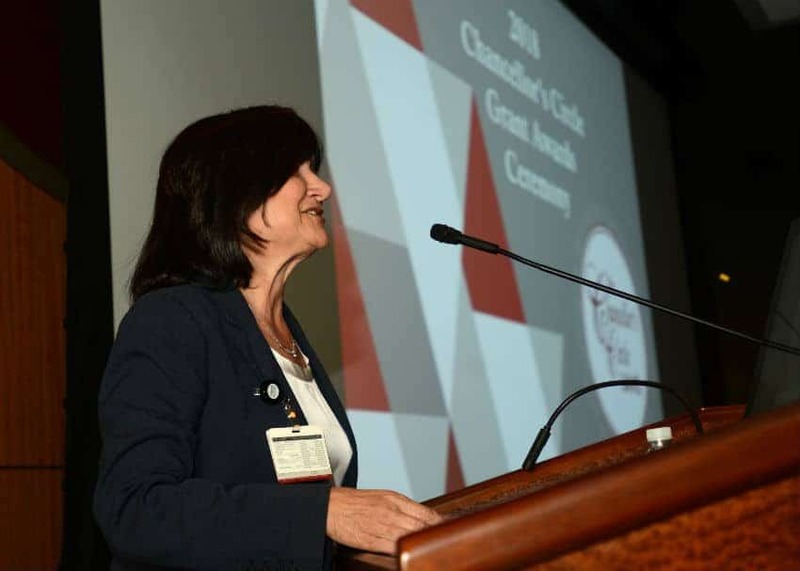 UAMS Interim Chancellor Stephanie Gardner, Pharm.D., Ed.D., announced 13 recipients of the annual Chancellor's Circle awards on March 7. March 12, 2018 | March 12, 2017 | UAMS Interim Chancellor Stephanie Gardner, Pharm.D., Ed.D., awarded a record $425,000 to 13 UAMS programs at the annual Chancellor’s Circle Grant Awards ceremony and reception March 7. The awards were the most funds ever distributed by the Chancellor’s Circle for the second consecutive year, Gardner said. Since 2014, when the awards were first held, the Chancellor’s Circle has awarded more than $1.5 million in grants to 56 UAMS programs. Members of the Chancellor’s Circle provide roughly $450,000 annually in discretionary funds that allow UAMS to provide additional support to the key mission areas of health care education, medical research and patient care. Since its creation in 1984 by the UAMS Foundation Fund Board, the Chancellor’s Circle has raised nearly $9 million to support UAMS’ mission. Members of the Foundation Fund Board’s Philanthropy Committee, including Sandra Connor, Charlene Reed, Beau Blair and Jeanne Heard, M.D., Ph.D., were on hand to present notebook-sized novelty checks to each recipient. College of Health Professions to jointly develop an occupational therapist education program with the University of Arkansas at Fayetteville College of Education and Health Professions. Sherry Muir, Ph.D., program director for the occupational therapy program, and Susan Long, Ed.D., interim dean and for the College of Health Professions, accepted the $100,000 award, which is the largest grant to date for a recipient of a Chancellor’s Circle award. Winthrop P. Rockefeller Cancer Institute in pursuit of National Cancer Institute Designation, which would allow UAMS to build on its current research platform and clinical trials with increased funding and advanced therapies. Peter Emanuel, M.D., director of the Cancer Institute, accepted the $75,000 award. College of Pharmacy for its innovative pharmacy program, which works to establish sustainable and progressive models of pharmacy practice, develop and support innovative postgraduate residencies, and engage in implementation science through the integration and evaluation of new practice models. Geoff Curran, Ph.D., director of the Center for Implementation Research in the College of Pharmacy, accepted the $35,000 award. College of Nursing for its newly created anesthesia specialty in its Doctor of Nursing Practice program, which will provide educational and experiential preparation for registered nurses who seek advanced practice roles as nurse anesthetists. Patricia Cowan, Ph.D., R.N., dean of the College of Nursing, accepted the $35,000 award. Office of Population Health to create a best-in-class population health management program through resources from clinical care, information management, care coordination, new models of health care funding and community partners. Stephen “Steppe” Mette, M.D., chief clinical officer for UAMS Medical Center, and Robin Reed, M.D. M.P.H., director of the population health program, accepted the $50,000 award. College of Medicine for its Graduate Medical Education team, which supports and oversees 60 fully accredited residencies and fellowships, to expand graduate medical education across the state. Jim Clardy, M.D., associate dean for graduate medical education, accepted the $50,000 award. UAMS Day of Giving, a 24-hour event celebrating the institution’s commitment to better health, which last year raised more than $300,000 in a single day, the largest single-day philanthropic effort in UAMS’ 138-year history. Amanda May, director of annual giving, accepted the $10,000 award as a challenge gift in anticipation of this year’s event. Colleges of Medicine, Nursing, Pharmacy, Health Professions and Public Health for scholarships to help attract outstanding students to UAMS who want to make a difference in their communities. Accepting $10,000 each on behalf of their respective institutions were Susan Long, Ed.D., interim dean for the College of Health Professions; Kathryn Neill, Pharm.D., associate dean for administrative and academic affairs in the College of Pharmacy; Patricia Cowan, Ph.D., R.N., dean of the College of Nursing; Kevin Ryan, associate dean for professional programs in the College of Public Health; and Tom South, assistant dean for admissions in the College of Medicine. UAMS Child Development Center to facilitate creation of a child care facility to support UAMS staff and faculty. Jeannette Shorey, M.D., associate provost for faculty, and Meredith Garner, director of development for the Harvey & Bernice Jones Eye Institute, accepted the $20,000 award. The Chancellor’s Circle, established by the UAMS Foundation Fund Board, recognizes those donors who support programs at UAMS through annual unrestricted contributions. More than 300 household and corporate members make up the Chancellor’s Circle. To learn more about the Chancellor’s Circle, visit giving.uams.edu/chancellorscircle.